Newly appointed CEO Bryn Wesch says Novus’ West Palm Beach facility will extend the same compassionate care and successful outcomes its New Port Richey center is renowned for, helping to make sustainable sobriety a reality for even more patients. Novus Detox Center's newly appointed CEO, Bryn Wesch, announces their new facility is set to open in January of 2018. More than 20 million Americans are struggling with substance use disorders, fueling demand for effective alcohol and drug treatment programs that support long-term recovery. (1) To help meet that need, Novus Detox Center will be opening a new treatment facility in West Palm Beach, Florida, in January 2018. 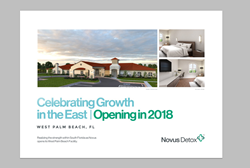 According to newly appointed CEO Bryn Wesch, the South Florida detox facility will embrace the same next-generation detox protocols and individualized care pioneered by Novus’ Gulf Coast facility in New Port Richey, empowering more patients to achieve sustainable sobriety. Novus offers medically supervised treatment programs that safely and effectively ease patients through withdrawal from alcohol, prescription medications and illicit drugs, and has gained renown for its success with high-dose opioid and methadone cases that other facilities are unable or unwilling to treat. The organization’s name reflects its philosophy: Navigating Obstacles Vital to Understanding Sobriety. Novus is recognized for its novel approach to helping patients create a new life free from dependency and addiction, combining integrated, individualized, patient-centered care with next-generation detox that incorporates forward-thinking technology and customized hydration and IV therapy. “We establish a long-term partnership with our patients, helping them re-imagine recovery and a new journey forward while laying the foundation for sustainable sobriety,” explained Wesch. “Novus has a history of successful outcomes that derive from our proven medical protocols and personalized treatments. All of our patients have round-the-clock access to nursing care and withdrawal specialists, and we maintain a tranquil, comfortable, spa-like environment that is designed to promote healing and relaxation.” She explained Novus’ West Palm Beach facility will deliver the same experience and amenities that have made the New Port Richey location the preeminent detox center in the Southeast region. Novus’ new 18,000 square-foot facility is located on 4.7 acres in West Palm Beach, and will house 41 beds in private and shared rooms with private baths. Coupled with Novus’ existing 31-bed facility just outside Tampa Bay, the new location will allow Novus to double in size and add 70 new staff members. Finally, Wesch notes that Novus’ holistic approach goes beyond medically supervised inpatient care, with an emphasis on conditioning both the body and the mind for a healthy future. She further explained that healing begins in the mind, which is why it is essential to treat the whole patient rather than just their symptoms. Novus is a strong proponent of humanized care; and believes that forging genuine relationships and providing emotional support can help prevent relapse. “We treat all patients with dignity and respect, and work to make them safe and comfortable to minimize the pain of withdrawal so they can move forward and reclaim their lives,” said Wesch. For more information on Novus Medical Detox Center and its medically supervised treatments—including alcohol detox, opiate detox and other drug detox programs—visit https://novusdetox.com. Novus Detox Center is soon to be operating two inpatient medical detox facilities that are licensed by the Florida Department of Children and Families and have earned The Joint Commission’s Gold Seal of Approval for Behavioral Health Care Accreditation. Renowned for its pioneering approach to Sustainable Sobriety™, Novus provides safe and effective alcohol and drug detox programs that combine next-generation treatment protocols, 24/7 medical supervision and integrated, individualized care. By conditioning the body and mind to re-imagine a fulfilling, drug-free future, Novus empowers patients on their journey to recovery and creates a solid foundation for long-term success. Novus is committed to leading the way in patient experience, both as a detoxification expert and a supportive partner in ongoing health and wellness, and is dedicated to pushing industry standards forward. The original Florida detox facility is located in New Port Richey (outside Tampa) and another is soon to open in West Palm Beach; both feature a wide range of amenities, delicious and healthy meals, and a relaxing, spa-like environment to ensure the withdrawal process is as stress-free and comfortable and as possible. For more information on Novus’ medically supervised detox programs, visit https://novusdetox.com.